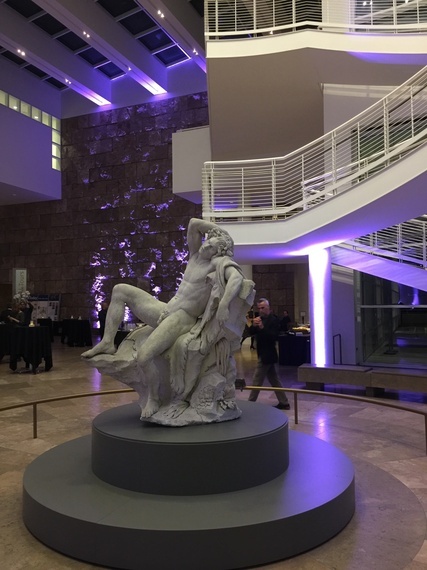 As imposing as it is, never before has the entrance hall of the Getty Museum looked as dramatic and impressive as it does now, with the newly installed life-size marble sculpture of the Sleeping Fawn by 18th century French artist Edme Bouchardon (1698-1762). The presentation of this sculpture plays a role not unlike that of a musical overture at the beginning of an Italian opera before the curtain goes up. Here at the Getty, this sculpture captures one's attention as the introduction to the grand presentation of works by Bouchardon, one of the most important French artists of the 18th century. In a rare partnership with the Musée du Louvre, the Getty Museum brought this exhibition to L.A. after it was initially shown last autumn in Paris. 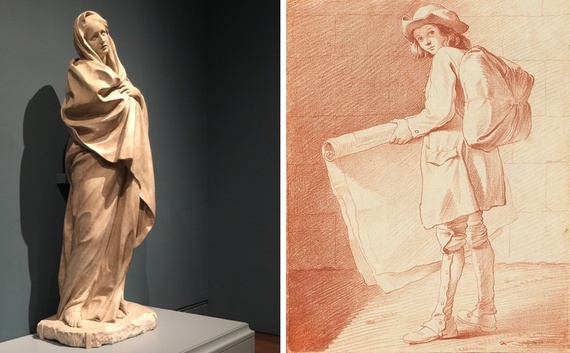 With 30 sculptures and 100 drawings and prints on display, this exhibition "Bouchardon: Royal Artist of the Enlightment" demonstrates his astonishing craftsmanship. One wonders why his art isn't better known outside of France. Like many ambitious artists of his time, Bouchardon travelled to Rome, where he spent 9 years studying and copying classical art. His medium-sized marble panels --allegories of the four seasons -- with their adorable images of children are simply irresistible, at least to my eye. 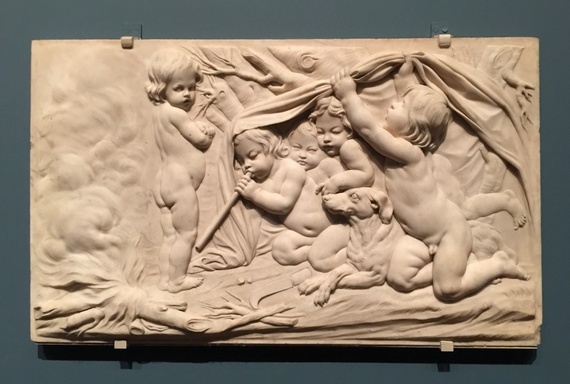 Here, Bouchardon's artistic showmanship is at its best. But as delightful as it is, it comes at the price of originality. At this point, I want to mention the name of Jean-Antoine Houdon (1741-1828), a strikingly original French sculptor of the Enlightenment whose 2003 exhibition at the Getty was a showstopper. The Bouchardon exhibition ends with the puzzling presentation of a single bronze hand -- the only surviving relic of his monumental bronze equestrian sculpture of Louis XV that once stood in the Place de la Concorde. 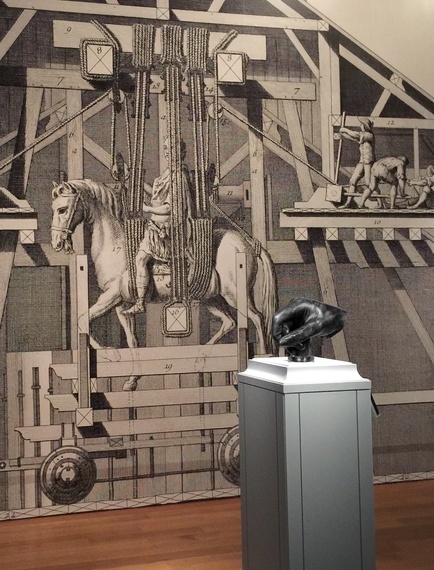 This equestrian sculpture was destroyed during the French Revolution. Which brings to mind the explosive subject of politics and art: just think about all the ancient art intentionally destroyed during recent turmoil in the Middle East. Top: Karl Haendel, Hillary Clinton, 2016. Pencil on paper, speaker, and audio recording. Bottom: Karl Haendel, Rodeo 8, 10, & 3, 2016. Pencil and graphite powder on paper. Another exhibition demonstrating high artistic virtuosity, along with an interest in politics, opened over the weekend at Susanne Vielmetter Gallery. A solo exhibition by Los Angeles-based artist Karl Haendel occupies the entire gallery. Upon entrance, visitors are greeted by mural-sized drawings of teenage girls riding rodeo. These heroic images successfully challenge prevailing stereotypes of masculinity. The draftsmanship of these figurative drawings is at the highest level, and it's impossible not to be impressed. 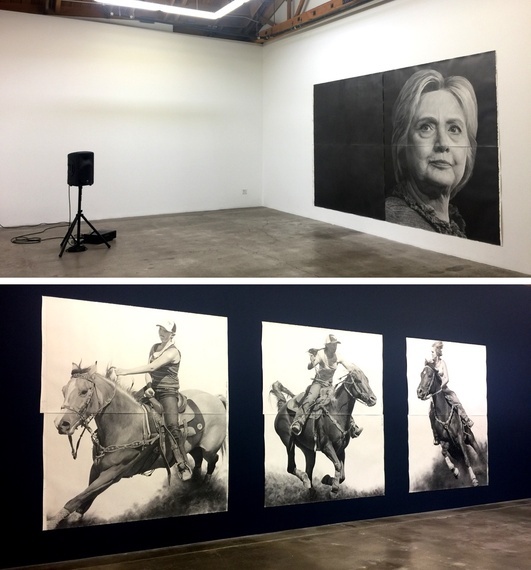 But further back in the gallery, there are installations with portraits of two politicians and, in both cases, the impressive draftsmanship of the execution becomes secondary to the emotional complexity of these two portraits: one of Hillary Clinton, and the other of Barack Obama. With its heroic scale and pensive mood, Hillary's portrait is simply startling. 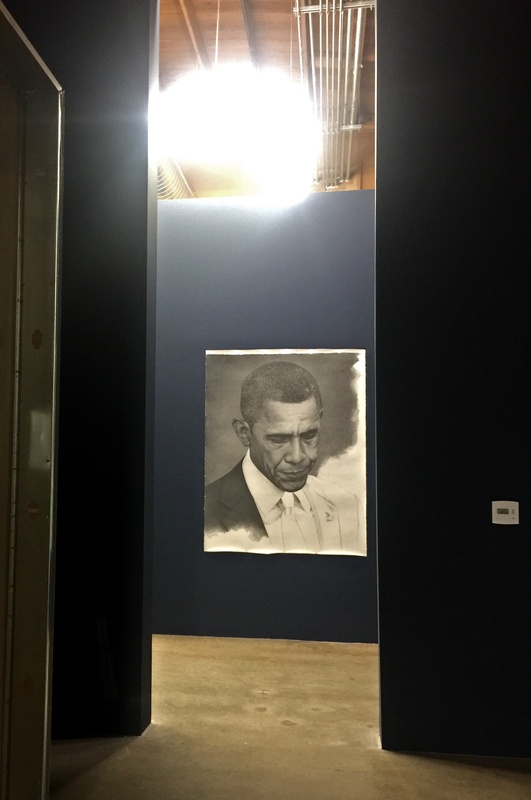 Nearby is Obama's portrait, smaller in scale and purposely left unfinished. It's not just pensive, it's deeply melancholic. One hopes this won't be the prevailing mood of the upcoming farewell address by President Obama. Edward Goldman is an art critic and the host of Art Talk, a program on art and culture for NPR affiliate KCRW 89.9 FM. To listen to the complete show and hear Edward's charming Russian accent, click here. To learn about Edward's Fine Art of Art Collecting Classes, please visit his website. You can also read more about his classes in the New York Times here, and in Artillery Magazine.